Greenfields in Indonesia has launched a chilled yogurt drink in easy-to-carry plastic bottle for on-the-go consumption. This RTD yogurt drink in 250ml is available in several variants including blueberry, mango and mixed fruit flavours. The introduction of Greenfields yogurt drink with active cultures comes after the earlier launch of Greenfields spoonable yogurt at the end of 2017. 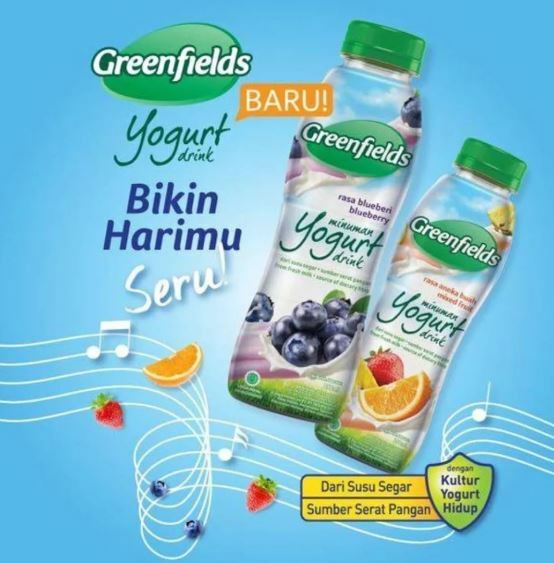 Greenfields yogurt drink is available at Super Indo at a regular price of IDR 8,490 per bottle. The promotion price is IDR 6,790. It is highly likely Greenfields yogurt drink will be exported to Singapore, Malaysia, Brunei and Hong Kong as the names of the importers are listed on the pack.